How do I take my antimalarials? Chloroquine, Proguanil - Start one week before travel, throughout your stay in an endemic area and continue for four weeks after return. 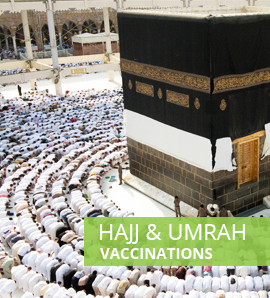 Mefloquine (Lariam) - Start two and a half weeks before travel, throughout your stay in an endemic area and continue for four weeks after return. Doxycycline - Start two days before travel, throughout your stay in an endemic area and continue for four weeks after return. Malarone - Start two days before travel, throughout your stay in an endemic area and continue for one week after return. 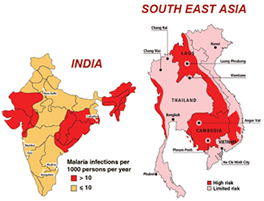 Malaria is a serious and sometimes fatal disease which is widespread in many tropical and subtropical countries. It is caught by being bitten by an infected mosquito that is carrying the malaria parasites in its saliva. The malaria parasite is a microscopic organism called a Plasmodium and it belongs to the group of tiny organisms known as protozoans. There are four types of plasmodium: P. falciparum (the most dangerous), P. vivax, P. ovale and P. malariae. 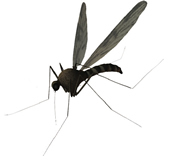 The species of mosquito that carries the malaria parasites is the Anopheles mosquito. Malaria occurs in over 100 countries and more than 40% of the people in the world are at risk. 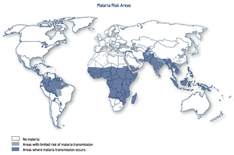 Large areas of Central and South America, Hispaniola (Haiti and the Dominican Republic), Africa, the Middle East, the Indian subcontinent, Southeast Asia, and Oceania are considered malaria-risk areas. How can I prevent infection? Medicines which previously were only prescribed by your doctor can now be supplied by pharmacists at this particular pharmacy. Between 1990 - 2009, every year approximately 1,800 British travellers returned home with malaria. The UK is one of the biggest importers of malaria into Europe. Any traveller who becomes ill with a fever or flulike illness while travelling and up to one year after returning home should immediately seek professional medical care. You should tell your GP that you have been travelling in a malaria-risk area. Malaria can be cured with prescription drugs, however, the damage caused can be with you for the rest of your life so protection is vital. Are the medicines for yourself? Travelling with children or infirm adult? Will you be in very remote areas? Do you have any repellent or mosquito nets? Have you had antimalarials before?